NASA announced on October 30 that the Kepler space telescope has run out of fuel, ending a scientific mission that began in March 2009 and gained new life in 2014 after its primary mission ended because of mechanical failure. 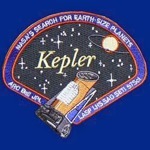 Kepler discovered well over 2,000 confirmed exoplanets, with almost 3,000 more candidates still being evaluated. It also measured the brightness of half a million stars and observed phenomena inside the Solar System as well. Congratulations to the Kepler mission teams and all of NASA on one of this century's premier scientific success stories.